You've likely read the headlines about Russian interference with the 2016 election as well as WikiLeaks, the DNC hack, and John Oidesta's emails. What 2016 showed us is that our systems are far too vulnerable to attack and manupulation. 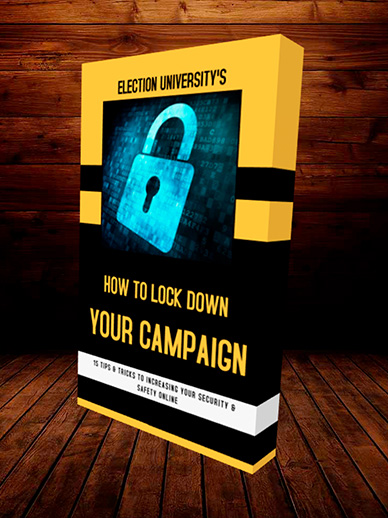 After consulting with cybersecurity and tech industry experts, we pulled together a FREE downloadble ebook that contains 15 simple tips and tools you can use to increase your personal and campaign security as much as four-fold over your likely current security level. Many of these suggestions contained are free, others are very low cost and simple tools to really boost your security and safety. Also, don't miss our two-part cybersecurity podcast interviews: Locking Down Your Campaign Security and Voter Integrity & Voter Protection. Both episodes are excellent primers for what experts see on the horizonas new threats to our electoral system and what you can do about them. For a FREE copy of the ebook, please enter your information in the pop up modal window on this page. Thank you!